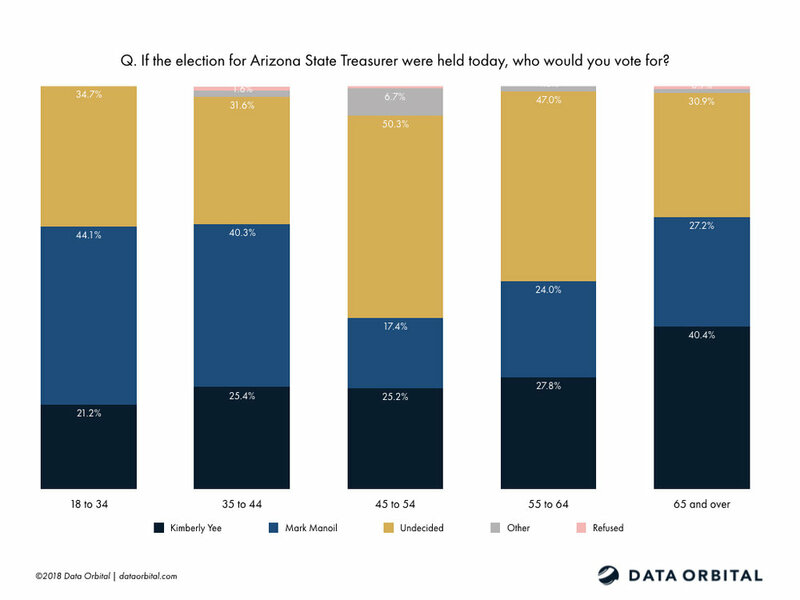 Phoenix, AZ (July 25, 2018) - Looking ahead to the general election and the race for Arizona State Treasurer, Data Orbital is proud to release new survey numbers. Additionally, Data Orbital continues our polling on President Trump's favorability with voters across Arizona. The survey polled likely general election voters across Arizona and was conducted over three days from July 19th-21st. With former Arizona Treasurer Jeff DeWitt being nominated and confirmed as NASA CFO and AZ Governor Doug Ducey's appointee Eileen Klein not running, the race is between Arizona State Senate Majority Leader Kimberly Yee and political newcomer Mark Manoil. Currently, Yee leads at 31.2% with Manoil at 28.8% and over a third of voters undecided. Looking across likely voter age groups, Yee is doing best with voters who are 65+, with 40.4% of respondents supporting her. Looking at the other end of likely voter age groups, Manoil is currently at 44.1% with 18-34 year olds. Lastly, looking at a breakdown of this race by Arizona region, Yee advances above the toplines in the population dense Maricopa County. Pima County currently has the highest percentage of undecided voters at 44.7%. Our latest poll shows the President back underwater with Arizona voters with 42.8% of voters being favorable and 47.8% unfavorable. Looking across time, we see this movement from our last survey of Arizona on Presidential Favorability. Looking deeper into the crosstabs we breakdown Presidential favorability by political party. Lastly, we breakdown Presidential favorability by age group. George Khalaf, President of Data Orbital, issued the following statement on these results: "The Arizona State Treasurer's race is a good example of statewide sentiment on generic Republican and Democratic candidates. With little money being spent by both candidates in an office unknown to most, voters are looking to the party affiliation of the candidate as they make their choice. Looking at the President's favorability, we see Arizonans falling in line with the national trends we are observing"
This poll of 600 likely Arizona general election voters was conducted through a live survey that collected 70% of the results from land lines and 30% from cell phones. It has a margin of error at plus or minus 4.00%, with a 95% confidence interval. Respondents were weighted on a number of different demographic figures based off historical Arizona general election turnout. The poll was conducted over three days from July 19th-21st. All non-released questions prior to questions released would not reasonably be expected to influence responses to the released questions. The questions released are verbatim from the survey provided to respondents. Toplines and demographic data can be found here and cross tabs here.